A beautiful magazine, professional in every respect, and I am very pleased to have been part of its creation—a part perhaps no bigger than a mustard seed as your grandmother Hester might say, but still a part of the whole. Moonlighting as your father? Moonlighting? Being your father has always been and will always be a full time job. All those years since you stubbornly insisted at birth in presenting the soles of your feet to the world first instead of your head, have been a full time job. I will admit, however, although presented last instead of first, your head was beautifully rounded, and certain features such as the temporarily flat noses that were presented by your siblings at birth were absent in your case. The flat noses were caused by the long slide, of course, and soon rebounded. My moonlighting since then has consisted of incidental tasks such as making a living to keep food on the table and shoes on everybody’s feet, assisting my country in losing two wars—Korea and Vietnam—working overtime to staunch the flow of illegal narcotics and illegal aliens into the US, detouring harmful plants, animals and vegetables away from our fields, cities and tables and documenting the outflow and inflow of US citizens. Yep, I had a full time job just trying to keep up with you, an effort in which I failed miserably. Six degrees of separation? That leaves some 354 degrees of separation between your mastery of so many varied skills and my success in trying to emulate them, so much separation that I officially surrender. I give up, but I am exhilarated by the fact that you could not have done any of them without me. I take full credit for your creation—okay, half the credit—okay, okay, let’s just say that I suggested to your mother that we should have a second child—I guess one could say that I planted the seed, so to speak. Of course, I only suggested that to her after she announced that she was again in the family way—folks didn’t use the word pregnancy back in those days—they said in the family way. Nice work—kudos to you and Barbara for an outstanding publication. The July/August 2011 issue of Hearing Loss Magazine (HLM), which I design and produce bimonthly for the Hearing Loss Association of America (HLAA), is hot off the press! This month’s “cover guy” is my friend and fellow blogger from Oslo, Norway—Ulf Nagel, accompanied by his handsome son, Oskar. I discovered Ulf’s insightful, well-researched and painfully honest blog, Becoming Deaf in Norway, on Abbie (Cranmer) Hlavacek’s blogroll a few years ago. After reading Abbie’s blog about her hearing loss journey, I knew we had to feature her in the magazine. Abbie wrote her feature for the May/June 2008 issue of HLM and I spotlighted her on this blog here. A few years later, she and future husband Todd hired me to photograph their wedding in October 2010. Learn how I first met Abbie (and her friend and bridemaid, Jennifer Thorpe) here, read the first recap of Todd and Abbie’s wedding day here, view Abbie’s stunning bouquet crafted by her friend and “second mother” Phyliss Hendley here, and see more wedding photos here, here, and here. The Internet and the world of blogging has introduced me to so many wonderful people from all walks of life and I’m always fascinated by the way stories and people weave in and out of those experiences. Discovering Abbie Cranmer via her blog resulted in her being featured in the magazine and me photographing her wedding just two years later. Abbie was an Advanced Bionics (cochlear implant manufacturer) mentor and was helping Todd’s brother, Gregg Hlavacek, through the process. Gregg introduced Abbie to Todd Hlavacek via e-mail during the mentoring process and the two fell in love online! Abbie and Todd are expecting their first baby, a boy, in late September. I discovered Abbie’s friend and future bridesmaid, Jennifer Thorpe, on Abbie’s blogroll. I then met and photographed Jennifer and her lovely family at the HLAA Convention in Nashville in 2009. A year later, Jen wrote her feature article, I Am Simply Me, for the July/August 2010 issue of Hearing Loss Magazine. Click here to download the pdf of that article from HLAA’s website. And the connections just get better—as a result of the photographs I shot of Abbie & Todd’s beautiful wedding, HLAA member Tina Fifer and her future husband, Tom Hamblin, hired me to photograph their wedding this October! Last month I posted their engagement photo on my blog here. Tina just happens to work with HLAA member Mike Royer. I met Mike Royer at a stock photo shoot for HLAA three years ago, then photographed his adorable family in my studio here and here. Mike and Alicia asked me to photograph the birth of their youngest child, Ashley, in August 2008. In her spare time, Alicia is an artist and a blogger, too. I wrote about her pastel work here. 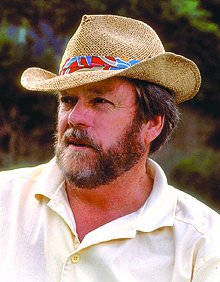 Mike later suggested that we profile the acclaimed and prolific painter, Charles Wildbank. Charles and I have connected through e-mail and Facebook and have become friends. He will be featured in a future issue of Hearing Loss Magazine. I wrote about Charles and his artwork on my blog here. Do check out his work—it is nothing short of stunning! And finally, Jen’s blogroll listing led me to Ulf’s blog! 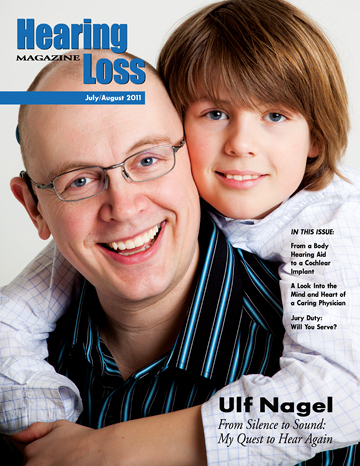 I wrote to Ulf and asked if he would be interested in sharing his story with Hearing Loss Magazine readers. With editing and compilation assistance from The King of Texas (who also moonlights as my father, Hershel M. Dyer) and beautiful photos by Anne K. Haga, Ulf’s story—From Silence to Sound: My Quest to Hear Again—is now in print. Read the full article by clicking on the link here: Ulf Nagel Feature. Do you have a hearing loss or know someone who does? Consider membership in the Hearing Loss Association of America. Student annual dues are $20, individual annual dues are $35, and family/couple annual dues are $45. Fees outside the U.S. are slightly higher. All memberships include discounts on hearing-related products, convention and special event early bird discounts, AVIS and Alamo car rental, Costco membership, and the award-winning Hearing Loss Magazine. Sign up for membership here. On April 12 Michael and I attended one of two travel writing lectures, part of the National Geographic Live! series. At the reception prior to the lecture, we feasted on Italian appetizers (an unexpected surprise, and welcomed since we hadn’t eaten dinner first!). Frances Mayes was the guest author that evening. Mayes is the best-selling author of Under the Tuscan Sun and Bella Tuscany. Her recent book is Every Day in Tuscany, which chronicles her latest renovation project—a 13th-century house in the mountains above Cortona. National Geographic Traveler editor Don George hosted the interview. George is a legendary travel writer who has worked as a travel editor at the San Francisco Examiner & Chronicle and was the Global Travel Editor of Lonely Planet Publications. His books include The Lonely Planet Guide to Travel Writing, The Kindness of Strangers, Tales from Nowhere, By the Seat of My Pants, and his latest book, A Moveable Feast. He also writes the “Bookshelf” column in National Geographic Traveler magazine. We thoroughly enjoyed the interview. Frances Mayes weaves a verbal tale as well as she writes one and Don George asked a wide range of questions about her life in Italy and her writing process. I learned that Mayes was born and raised in Georgia, where many of the relatives on my mother’s side live. 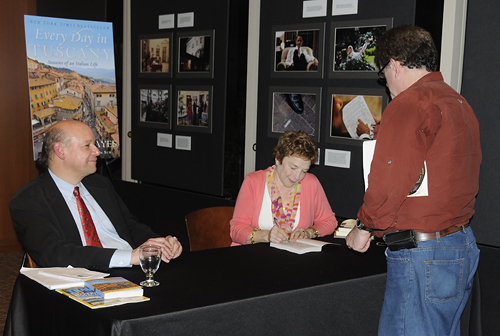 During the book signing, I got a chance to chat with her about Swan, the town she lived in. I told her that as a child I spent a few weeks every summer in Georgia with my maternal grandmother and various aunts, uncles and favorite cousins. Mayes and her husband now divide their time between their homes in Cortona and North Carolina. We bought several of her books and she signed them for Michael while I got the record shot. Check out her website and journal here. On May 12 we attended the second lecture in the series. Don George conducted the interview with actor/director (and now award-winning travel writer) Andrew McCarthy (what girl didn’t crush on him in his younger days…hello?). While I was able to get some shots during the Mayes lecture, the McCarthy lecture was being filmed and the audience was specifically told “no photos.” Bummer. I had my gear with me, of course, and was all set with my ISO at 2000 or something like that, but I didn’t want to risk getting thrown out. So, no photos of the older (but still as handsome) McCarthy. One of the National Geo employees saw me raise my hand and came down to kneel by me while McCarthy answered a question from the other side of the room. Before I could ask the question, another attendee stole the question right out from under me. Bummer. McCarthy’s (paraphrased) answer: “No, not really.” (This would have been a very short interaction with him!) Apparently National Geo either has someone travel separately or must use existing stock to illustrate some of the places he writes about. While he has had photographers travel with him, he said he much prefers traveling solo. Learn more about his acting career (St. Elmo’s Fire, Pretty in Pink, Weekend at Bernie’s, and Mannequin, to name a few) and directing career (Gossip Girl and several theater productions) and read some of his writing on his site here. Read his profoundly moving essay, “Going Back In,” which he wrote for the August/September 2009 issue of National Geographic Adventure. You’ll find that article by clicking here, then click on the Adventure magazine cover in the second row. Since I didn’t get the photographic bounty I usually do at Kenilworth, I thought I’d repost images I’ve created in past years. Enjoy! 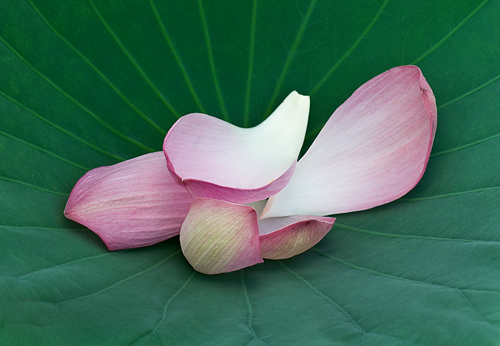 In past years the Lotus flowers have bloomed just in time for the annual Water Lily Festival and Festival of Lotus and Asian Culture at Kenilworth Aquatic Gardens on the third Saturday in July. This year the flowers, particularly the white variety, seem to have peaked much earlier than usual. 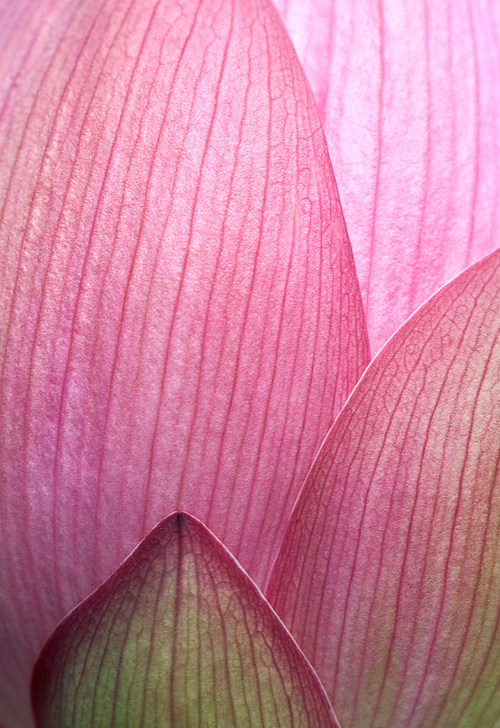 Most are past their prime blooming stage, but there were lots of opportunities to photograph spent petals in those beautiful Lotus leaves! 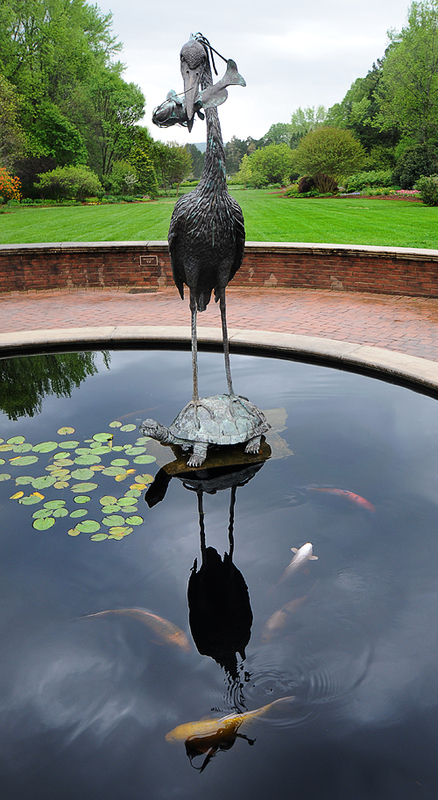 There are plenty of pink blooms that haven’t flowered yet, though, and there are several ponds that are chock full of beautiful magenta-colored water lilies. Click on the panoramic image below to enlarge for full effect! The place was a flurry of activity this morning, with children on field trips and student volunteers doing everything from garden chores to turtle counting. They caught the turtles in nets, pulled them up, filed a notch in the shells of those that weren’t captured previously, then released them back into the ponds. Michael saw a foot-and-a-half-long snapping turtle pulled to the surface and then released. 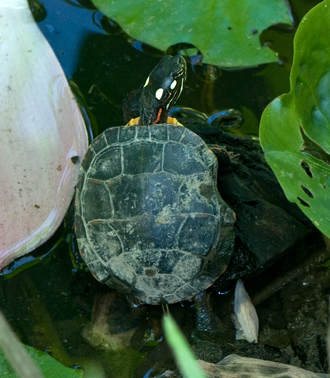 Before I knew they were doing the turtle counting procedure, I saw a four-inch-long Red-eared slider by the edge of one of the ponds and was able to get the “record shot” at right (definition of a record shot: certainly won’t win any awards, but they’re proof I was there!). We’re pretty sure the dent on his right side wasn’t the work of a turtle counter since Michael said they were making the file marks on the shells near the back of each turtle and the notches were very tiny. As I was wrapping up my very brief photo session at the park (it was too sunny to shoot any winners; no clouds to help out, either! 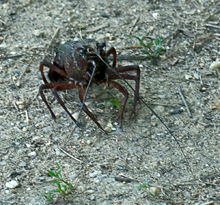 ), I looked behind me on the path and saw something dark, shiny, at least four inches long, with lots of legs. My first thought was “very large spider!” I moved closer and saw it was a crayfish (crawfish or crawdad if you’re a southerner like me! ), hanging out on dry land. I got this one (slightly blurry) record shot of him and he skidaddled (slowly and backwards) back into the nearby pond. It was officially my first crayfish/crawfish/crawdad sighting ever!